Famous for only using Vintage and Reserve statements in the past, Glenrothes has changed direction and is now taking their portfolio along a more traditional route, featuring age statement single malts between 10 and 25 years (plus one non-age statement) in their new core range, the Soleo Collection. Released in the UK at the end of 2018, three expressions (out of the total five) were recently unveiled with great fanfare in Malaysia: the 12 Year Old, 18 Year Old, and 25 Year Old. The Soleo Collection is named in honour of the traditional process where grapes are left in the sun to dry prior to being made into sherry, resulting in the seasoned ex-sherry casks which are at the heart of this range. Appealing to the tastes of premium whisky drinkers, this collection boasts a very classic flavour profile with great influence from being 100% matured in first-fill sherry oak casks. 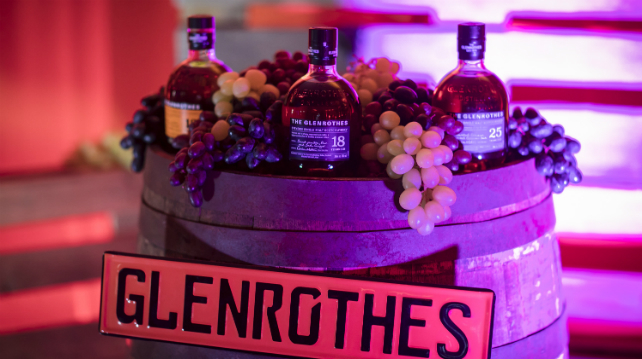 To start, the 12 Year Old is a modest entry-level Glenrothes single malt bottled at 40% ABV, with beautifully balanced notes of vanilla, melon, and cinnamon – a suitable option for crafting cocktails with, if we may say so. Following that is the 18 Year Old, bottled at 43% ABV, which also boasts flavours of vanilla, plus juicy pear and a zing of fresh ginger. Lastly, the 25 Year Old is a more flavourful expression – also at 43% ABV – with aromas of cedar wood on the nose, opening up to flavours of salted caramel, mango, and coriander seeds, and an enjoyable long sweet finish.